Chalkboard designs have been lighting up the Internet for the past few years. The said designs essentially have a chalkboard backdrop, and the user is free to use his creativity in crafting the content. Although using a chalk effect font is the first thing that comes to mind on what font to use in this invitation, different font styles (abstract, futuristic, calligraphy, techno, gothic, etc.) have been used to add variation, making an attractive contrast to the chalkboard backdrop. Chalkboard designs can be used for any occasion, and their versatility is limitless. Despite being more suited for a casual event, these designs can also be adjusted to fit a more formal setting. Here are some chalkboard invitation designs if you are planning to host an event such as a birthday party, wedding, or picnic. If you have trouble finding your preferred invitation design here, check out these other chalkboard designs. Cheap chalkboard invitation templates are also available, so check them out. 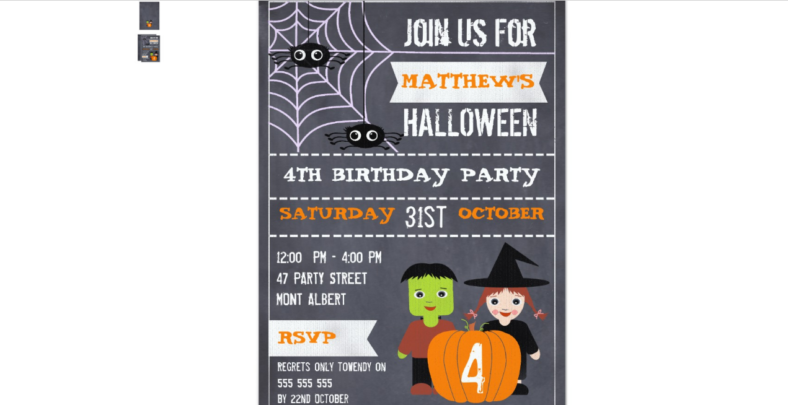 The season of scares and frights is just around the corner, so why not start preparing your Halloween party invitations? Chalkboard designs have black or blue backdrops and sometimes have the occasional chalk erasure. These chalk erasures can be used to represent ghost trails. This is certainly one of the best invitation designs for Halloween. Not all the objectives of Halloween invitations is to give some scares and send chills down the guests’ spines. The scary part can be saved for later in the event itself. Despite its dark theme, Halloween is also an occasion where both kids and adults dress up in their favorite horror, cosplay or superhero costumes, attending parties, and having a great time. In this chalkboard invitation design, Frankenstein and a witch are inviting you to a kids’ Halloween birthday party. These classic horror characters are given a cartoonish and child-friendly update since the event is for kids. Frankenstein’s menacing stare and the witch’s frightening smile are all absent in this invitation and are instead replaced with a cute doll-like appearance which more resembles a Disney cartoon. Spiders and their cute bulging eyes round up the design. The only terrifying look in this invitation is the font, but it doesn’t really affect the overall presentation of the invitation. 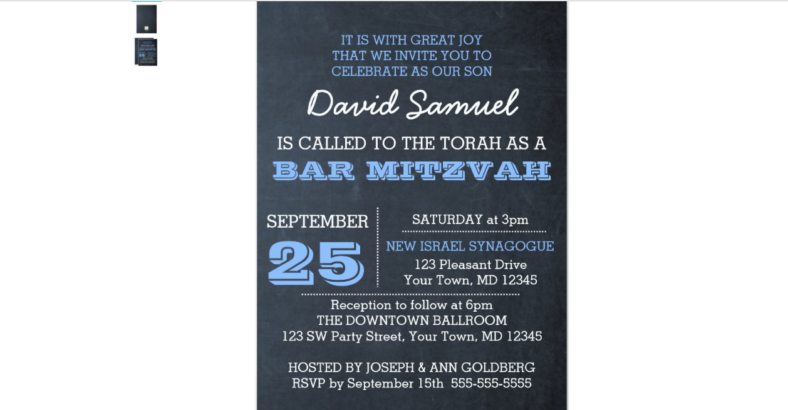 Bar Mitzvah is a traditional Jewish celebration which celebrates a boy’s coming of age. A Bar Mitzvah is held on the boy’s 13th birthday and it marks the time when he is already considered an adult and must be accountable for his actions. This event also requires the celebrant to be observant and compliant with the Torah’s commandments. A similar event is held for females on their 12th birthday called Bat Mitzvah. Traditional Jews consider this is as a formal event but it has been more casual since the dawn of the 21st century. In this invitation design, a lighter shade of blue is predominantly used as the main color which complements the chalkboard backdrop well. The fonts used also combines formal and more casual designs. There are no images in this invitation, simply the event details. Check these other baptism invitation designs for other baptism celebrations. A painting party is a very colorful yet messy celebration. This themed party is usually associated with a kids’ birthday celebration, where formality is not required and kids can go all out with their energy. Preparing a painting party is not complicated. Aside from buying food and balloons, the only things you need to purchase are easy wash tempera and acrylic paints, brushes, and canvases (optional). Depending on the number of invited guests (children included), a painting party can be quite expensive, as you won’t be expecting to assign one color of paint and one brush for each child and let him do nothing once he’s finished with his painting. Adults can also join in the fun, especially those skilled with the brush and canvas. Just don’t wear whites during this party. This invitation design does not tone down on the colors. It is beautifully crafted and uses a number of color combinations that fit perfectly with the chalkboard backdrop. Each letter in the word “PAINTING” is also given a different design and color which include plaid, curves, polka dots, and zig zags. 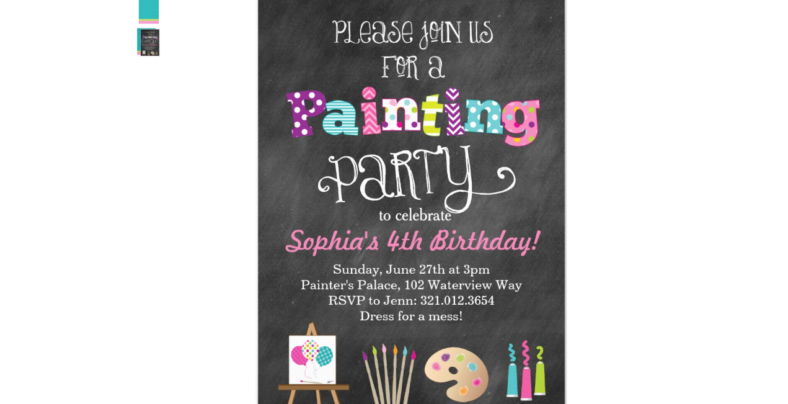 Cartoon painting tools including paint tubes, brushes, a palette, and a canvas complete the invitation design, creating a more fun and lively aesthetic that will definitely make the kids look forward to the event. Celebrating an infant’s first birthday is a monumental event. The child will definitely not remember his or her first birthday, but it is a special moment especially for the parents. These first birthday celebrations can make for great memories, especially when the parents and other relatives take photos with the child and show off those same photos once the child grows up. The chalkboard is sparingly used in this invitation as the baby celebrant provides the main attraction, but still provides enough attention not to get lost in the celebrant’s cuteness. The number one figure signifies the baby’s first ever birthday and all the details are listed inside the figure using a decorative style font. Light blue polka dots and the infant’s face occupy each side of the invitation’s background. This is a creative design which brings out the beauty of the three images (polka dots, number one, and infant) and strikes the right balance in that each image never overpowers the other. This is another baby-centric celebration which essentially reveals the baby’s gender during the party. This celebration is relatively new and is quite different from a baby shower or birthday, where guests have been informed ahead of time about the child’s gender which gives them ideas on what gifts to buy. Parents who like to celebrate each of their child’s milestones can start with the gender reveal party. Although not a requirement together with the baby shower, gender reveal parties are great ways to speculate with relatives and friends about the child’s personality, career, and relationships once he or she grows up. Gender reveal parties do not have to be a grand event, as it can become a simple get-together with a few special people. 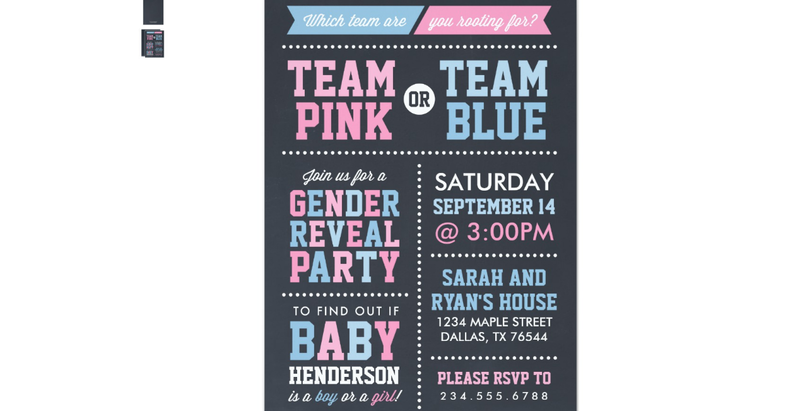 This awesome invitation design somewhat represents a competition in which guests are to choose between team blue (baby boy) or team pink (baby girl). A varsity-themed font is a perfect fit for this invitation, and the pink and blue colors are evenly and beautifully defined across the invitation. This is the perfect gender reveal party invitation as it does not only integrate the guests’ opinions in the invitations, but also exudes a cute yet sporty design. A wedding is probably the most important celebration in one adult’s life. It is a beautiful event shared with two persons starting life’s journey together as they go through the cycle of happiness, victory, pain, and struggle. It is also an event where family and friends celebrate the union of the bride and groom with lots of eating, laughing, crying, drinking, dancing, and picture taking. Making wedding invitations can be a tricky one, as it largely depends on the formality of the wedding. Don’t expect to make a casual invitation if you plan your wedding to be a religious and formal event. Check these wedding invitation mistakes to avoid when you start making those invitations. This wedding chalkboard invitation is a perfect fit for both casual and formal weddings. This black and white design does not contain too many designs (i.e. flowers in a vase, flower borders, etc.) but is already very attractive. Text is written in a beautiful calligraphy fonts, which is truly fitting for a wedding. Take a look at these wedding chalkboard invitations as well. What better way to celebrate being a senior citizen than by drinking beer? This 60th birthday party chalkboard invitation has a fun and entertaining design. Beer is the main design element used in this chalkboard invitation, informing the guests that there will be beer (and lots of it) during the party. This invitation only uses a two-color combination (gold and white) to match the chalkboard backdrop. Graduating from school is a student’s greatest achievement. All those late night studying sessions and group projects, a combination of great and poor exam results, and the occasional scolding have led to this moment of success not only for the graduate, but also for his or her parents. This definitely calls for a celebration.